SAGE India Digest: Are organizations ready for this burgeoning new generation that is entering the workforce in large numbers? Do they have strategies to engage them? Are organizations ready for this burgeoning new generation that is entering the workforce in large numbers? Do they have strategies to engage them? Millennials, also known as the Generation Y (Gen Y), born between 1980 and 2000, cannot be ignored. By 2025, they will make up roughly 75 percent of the world’s workforce. India will have the largest number of millennials anywhere in the world by the year 2021 but are organisations well prepared to cope up with the burgeoning new generation that is entering the workforce in large numbers? Facts suggest on the contrary that most companies are struggling to keep the millennial workers happy and engaged. The 2016 millennial survey by Deloitte on India has alarming news for companies in India. Almost 66 percent of the millennials or millennial workers in India are likely to change their companies by 2020. That works out to be two out of every three millennial workers in India. While world over similar trends are visible, India ranks third where there is largest probability of millennial workers leaving their current companies. Such poor level of engagement of millennial workers in India and rest of the world is a huge red flag for all companies. Poor engagement will not only have cost implications but will also have huge negative implications on the growth, profitability and sustainability of the companies, especially when going is not particularly easy for most of the industry sectors. Any short-sightedness in engaging millennials can affect a business firm adversely in both the short term and the long term. Research also points to the facts that many leaders and companies are oblivious to the changes in the workplace due to the change in the composition in the workforce and that there is a renewed need to understand the new workforce to engage them better. The fact is that most of the organizational designs are obsolete and do not match with the behaviour, mindsets or aspirations of the new generation. Companies need to urgently revisit and transform their organizational designs to engage millennials. Read more. 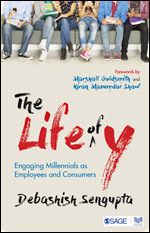 To read about new strategies to engage with the millennial generation in the workplace and marketplace in particular and the society in general, grab your copy of the book today.